“Battling the Death Star”: Seattle “Kayaktivists” Slow Arctic-Bound Shell Oil Rig as Fight Goes On | Democracy Now! oceans campaign director of Greenpeace. He was one of the activists, or “kayaktivists,” who was detained by the Coast Guard during the action against Shell oil drilling in the Arctic. The oil giant Shell is on its way to the Arctic, but not before a final showdown with environmental activists in kayaks. On Tuesday, dozens of “kayaktivists” were arrested after paddling up to a Shell drilling rig and preventing it from leaving the Port of Seattle. Several dozen supporters lined up behind them. The activists set off at 4 a.m. after learning of Shell’s plans to leave later that morning. Following a brief standoff, Shell’s Polar Pioneer was able to depart after the Coast Guard pulled the activists from the water. Monday’s action marked the latest in a series of protests since Shell arrived in Seattle last month. Shell is stationing its vessels in the Puget Sound while it drills for oil in pristine and highly remote waters in the Chukchi Sea off the coast of Alaska. Environmentalists warn Arctic drilling will threaten wildlife and worsen climate change. The Obama administration has tentatively approved Shell’s plans to begin oil extraction off the Alaskan coast this summer. We are joined by John Hocevar, oceans campaign director of Greenpeace. He was one of the activists, or “kayaktivists,” detained by the Coast Guard during Monday’s action against Shell oil drilling in the Arctic. AARON MATÉ: The oil giant Shell is on its way to the Arctic, but not before a final showdown with environmental activists in kayaks. On Tuesday, dozens of “kayaktivists” were arrested after paddling up to a Shell drilling rig and preventing it from leaving the Port of Seattle. Several dozen supporters lined up behind them. The activists set off at 4:00 in the morning after learning of Shell’s plans to leave later that day. Following a brief standoff, Shell’s Polar Pioneer was able to depart after the Coast Guard pulled the activists from the water. Monday’s action marked the latest in a series of protests since Shell arrived in Seattle last month. Shell is stationing its vessels in the Puget Sound while it drills for oil in pristine and highly remote waters in the Chukchi Sea off the coast of Alaska. Environmentalists warn Arctic drilling will threaten wildlife and worsen climate change. They fear a drilling accident in the icy Arctic Ocean waters could prove far more devastating than the deadly 2010 Gulf of Mexico spill, since any rescue operations could be delayed for months by harsh weather conditions. 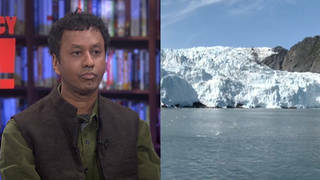 For more, we’re joined by John Hocevar, ocean campaigns director of Greenpeace, one of the kayaktivists detained by the Coast Guard during Monday’s action against Shell oil drilling in the Arctic. Explain why you’re protesting, exactly what took place, what it means to be a kayaktivist, John. JOHN HOCEVAR: Well, it was an exciting day, actually. There were about a hundred kayaks out there in the Puget Sound with people from all over the Seattle area there to try to delay Shell as long as possible, to keep their rig from moving to the Arctic. And there’s been enormous opposition to this very reckless plan, partly because of the damage that an oil spill could do in the Arctic. As you mentioned, it’s a very pristine area. With the ice conditions up there, with the lack of ports, no roads, minimal air support potential—the nearest Coast Guard station is probably a thousand miles away—it’s very, very difficult to even imagine how you would respond to a spill up there. We have communities, indigenous communities, that have depended on this area for thousands of years, and a really unique, special marine ecosystem up in the Arctic. So all that would be at risk if there’s a spill. And then, beyond that, of course, there’s the bigger climate change issue. As we all know, we’ve moved well past the point where it makes sense to allow huge oil companies to risk our future, the future of our planet and our communities. AARON MATÉ: John, as we’ve said, the administration gave Shell approval last month. Shell is now on its way. Its drill has left the port. But I understand that Shell still has some regulatory steps to go through. So after weeks of protests, is this battle over? JOHN HOCEVAR: It’s definitely not over. And in fact, after they finally managed to sneak out of Seattle, which they tried to do under cover of darkness but didn’t quite succeed, they met more kayaktivists in Bainbridge Island and then even more in Port Townsend, where there were more arrests and more delays for Shell. I think it was easily six hours after they finally escaped Seattle, they were still within sight of where they had been perched. So, you know, I think they’re in for protests for quite a while. This controversy is really going to be continuing. JOHN HOCEVAR: —going to be a difficult time for him. AMY GOODMAN: In the minute we have left with you, can you describe the action? What’s it like to go out in kayaks? I mean, this drilling rig, the Shell ship, is enormous. Your kayaks are tiny. JOHN HOCEVAR: That is true. It was like, you know, battling the Death Star. The thing is absolutely massive, and it looms right over the top of you, especially as, you know, Shell was allowed to move the rigs even with all these kayaks moving around right in front of it. And I think people did an amazing job of standing up to something like that and staying out there as long as we could. Ultimately, there were about 24 people detained by the Coast Guard, but we definitely gave—we ruined Shell’s day, and it caused them some new headaches. AMY GOODMAN: Well, I want to thank you for being with us. We’ll continue to follow the actions in this new battle of Seattle. John Hocevar, with Greenpeace, oceans campaigns director there, one of the kayaktivists who was detained by the Coast Guard during the action against Shell oil drilling in the Arctic.